Is there a better alternative to SmartMeal? Is SmartMeal really the best app in Cooking category? Will SmartMeal work good on macOS 10.13.4? With SmartMeal you would be able to calculate easily the nutritional values (as calories, proteins, fats,...) that are contained in your meals, so that you can cook and feed yourself in a healthy and balanced way. SmartMeal needs a review. Be the first to review this app and get the discussion started! SmartMeal needs a rating. Be the first to rate this app and get the discussion started! 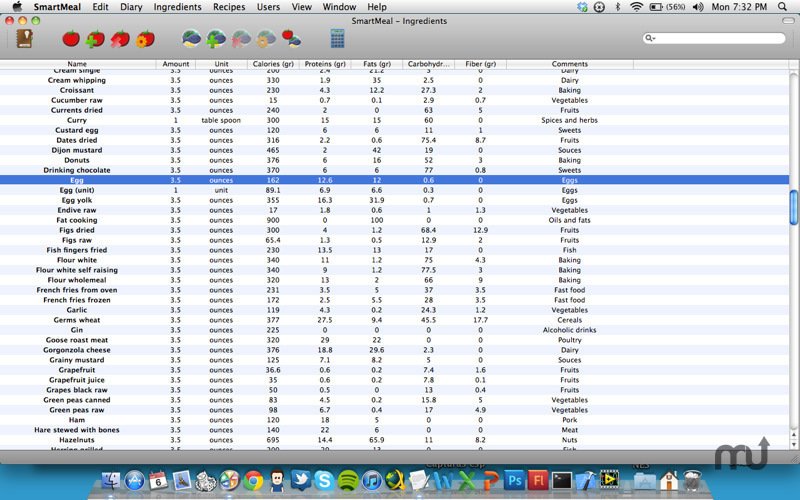 SmartMeal counts with a predefined data base which contains the nutritional values of almost 350 foods. Moreover, the data base can be configured to fit the user's preferences just by adding new ingredients or editing the ones existing. Use these ingredients to make your own recipes and calculate the ingested quantity of each nutrient. 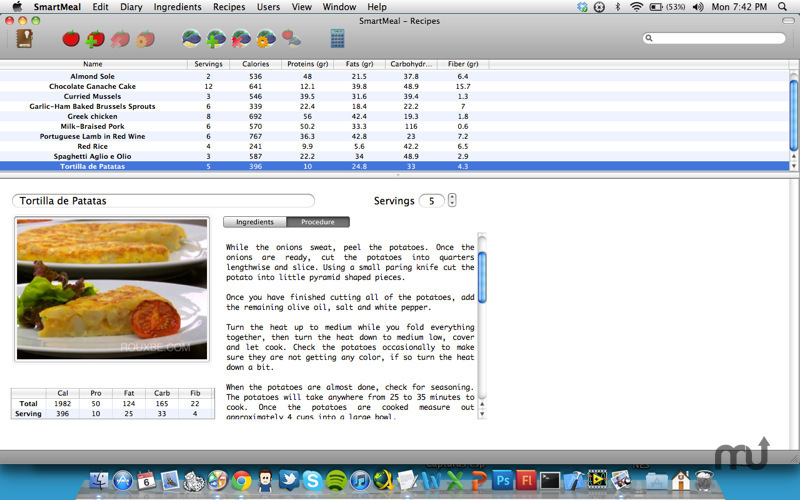 SmartMeal includes 10 recipes by way of example from the great http://www.rouxbe.com. Once the recipe has been introduced, SmartMeal makes it possible to calculate the necessary quantity of each ingredient so that you can cook the number of servings you want to. 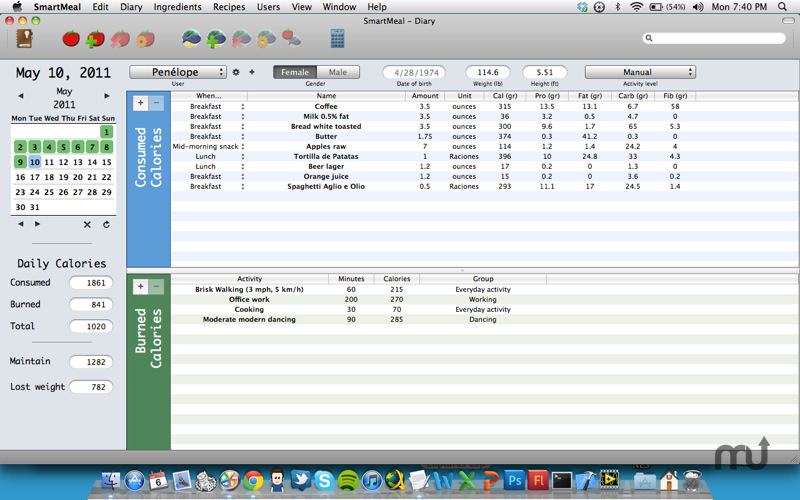 With Diary option you can add every single food you have consume during the day. This way you can control and register the consumed calories and compare them with those recommended for you based on your age, height, weight or daily phisical activity. It is also possible to calculate the calories burned off with your daily physical activities according to the activity, your characteristics and the time you spend on them. SmartMeal counts with a wide list of more than 80 activities which covers sports, dancing, daily activities, works, …It allows you to check your progress throughout the months since you can notedown your weight every day. And finally you can control more than one person by defining as many users as you want. SmartMeal is designed for automatically adapting to your device's predefined system of units, whether metric or american. 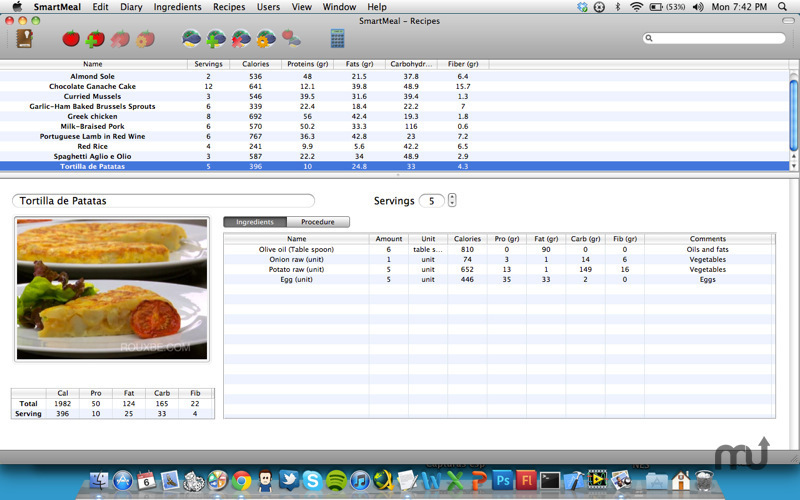 Configuarable ingredients data base, with 350 predefined food. Save your recipes, indicating the number of servings, the cooking procedure, the ingredients and even adding a photo. 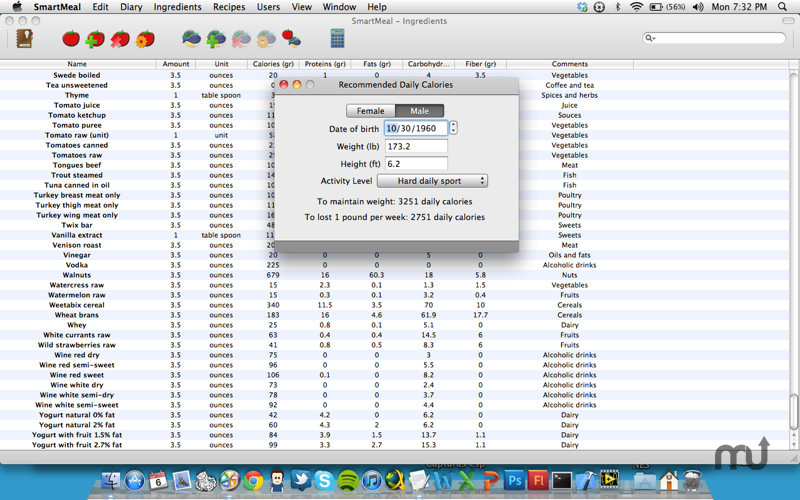 Calculation of the recommended daily calories according to your personal characteristics. Diary to note down all the food you consume each day as well as the calories consumed daily. Manual Calculation of the burnt up calories thanks to a list of over 80 activities. Possibility of defining different users.